Our firm's founder, Gordon R. Owens, began his CPA career with Rutten Welling & Co. in Detroit, which later merged with Haskins & Sells and is known today as Deloitte. Licensed in the State of Michigan in 1958, and with a very strong audit and tax background, Gordon helped grow those firms and mold his career. In 1977, Gordon started his own CPA firm to service businesses, individuals, and housing cooperatives with high quality audits, reviews, and tax preparation work. With the growth of new construction and developer conversion condominium associations throughout the Midwest, the firm increased its emphasis on providing services to these community associations. As the firm's client base grew, Linda R. Strussione joined the firm in 1983. Gordon and Linda continued to grow the practice together until his retirement in 1991, when Linda became the owner of the succeeding firm Owens & Strussione, P.C. For over 42 years and counting, Owens & Strussione, P.C. has been one of Michigan's leading auditing and tax firms in the area of condominiums, cooperatives, homeowner associations, and property owner associations. 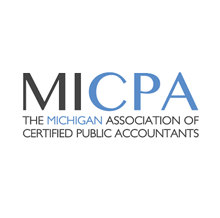 As a member of the American Institute of Certified Public Accountants (AICPA) and Michigan Association of Certified Public Accountants (MICPA), our firm has actively participated in the Peer Review Program since 1992 and has received the highest rating of pass for all peer reviews. We know that it is important to our clients to have experienced certified public accountants, auditors, advisors, and support staff working for them. Our current staff has over 86 combined years of experience, along with the knowledge and expertise in real estate, corporate, individual, and estate tax issues to provide the best possible results for our clients. By understanding your industry and individual issues, we are able to identify opportunities and provide professional guidance. We continually build our technical capabilities by providing industry-specific training to our staff. We also share this relevant industry knowledge with our clients, board members and property managers. Whether you are a current or prospective client, rest assured that those who choose Owens & Strussione, P.C. receive highly competent service. Our mission is to help clients maintain financial viability in the present, while taking a proactive approach to achieve future goals. This requires open communication to reach an understanding of our clients' needs through research and sound analysis. Owens & Strussione, P.C. is dedicated to meeting these goals with high standards of excellence and professionalism. We have been a staple of the area's business community for years, and pride ourselves on the level of esteem we have earned. Our dedication to hard work has earned the respect of the business and financial community in and around the area. We believe this to be a direct derivative of our talent and responsiveness to our client base. Whether you are a current or prospective client, rest assured that individuals and businesses who choose Owens & Strussione, P.C. receive competent and timely advice.